This spring project took us to the far eastern end of the county, but only for the day needed to erect it. One of the benefits of building using green oak frames is that all the work can be done off site; in our case, in our workshop in Falmouth, Cornwall. This project represents one way that work often comes to us; a potential customer approaches me with (or without) a set of architects drawings, I provide an estimate and then after discussing details and timescales, a fixed price quote. 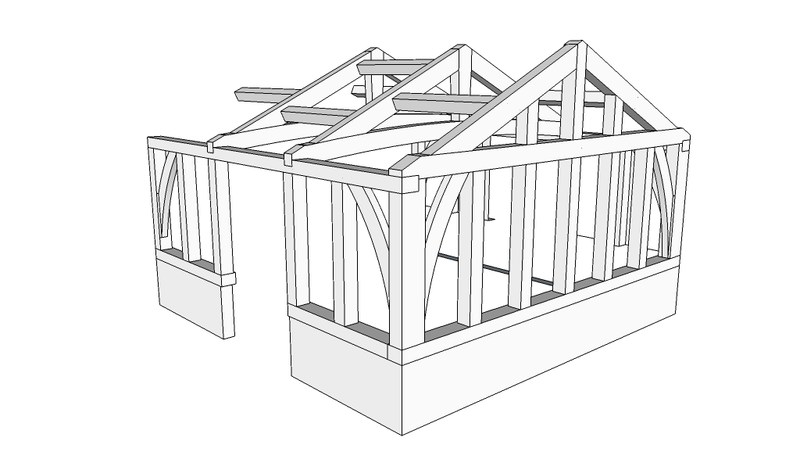 After receiving a deposit, I'll survey the site, order the oak, and design a frame to tie in with the architects drawings and the customers requirements. CAD drawings allow every detail to be assessed by the customer, the builder and ourselves, and once everyone's happy, cutting begins. After, in this case, a month's worth of crafting in the workshop, we're ready to load the trailer and head off for raising. Most projects can be raised in a day or 2, and it's always the most satisfying part of the job. The total time involved varies enormously. The above extension was over a year from initial contact to frame raising, whereas the next project took under 3 months start to finish. Generally we work on a 3-4 month lead time, though smaller projects can sometimes be fitted in at shorter notice; we're currently working on a couple of porches that fitted into the schedule nicely to keep us busy between the bigger projects. Photos to follow.